Saturday 20th October 2018 - 5th Annual Fall Camp Service Day! The camp has numerous camp equipment and game available for use (free) and some of the equipment is rentable. Please check the Equipment and Games Reservation form for what is available. The camp now has 10 canoes available, one sailboat, and one paddle boat. Paddles, and Marine Safety kit included with rentals, BUT Group must provide their own Personal Flotation Devices (PDF)/Life jackets for all participants. Check the Watercraft Rental Form for details. Phone - Public phone at corner store (Hwy 301 / Picanoc) Cell phone reception in some areas. Special Considerations - Propane is not supplied for cook stove & propane lighting in cabin. Bring what you need! Cost - Individual camp sites are priced at very attractive rates of between $15/night and $35/night and accommodate from a patrol group through to a section. The cabin is priced at $50/night. See the rate table for more details. The Camp is broken down into five (5) zones - A thru E. Structured Camp sites are located in Zones B, C, and D.
Zone A contains a large field which is a common area for all users. Camping is permitted in the field at the back of the field on either or both sides (North/South) (A1-A2). There is a Kybo in the woods at the back of the field, and one located to the east of the main gate. 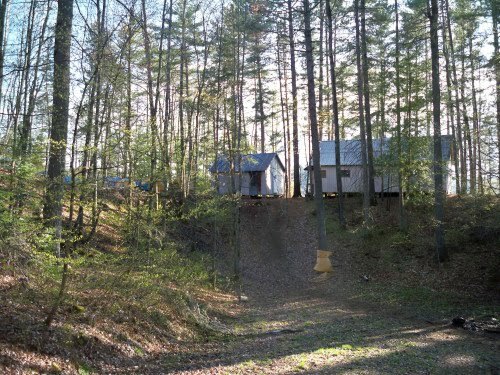 Zone B has camp sites primarily designed for Patrol sized groups (B2-B6), it also has the Richardson Cabin (B1), the Wood Shed, the dock, the beach, two(2) Formal Camp Fire Areas, and two(2) kybos. Richardson Cabin does NOT have electricity. It is Propane Lighting and stove, and heated by a wood stove. Zone C has three(3) section size camps (C1-C3), and two (2) kybos. Zone D has three(3) pack or patrol size camp sites intended to be used as a base camp and allow youth to build wilderness shelters in the surrounding forest. The area is intended for developing survival skills (D1-D3). Zone E is an unused area bound by the entrance road and the neighbor's lane way which cuts thru the camp property. See the Camp Zones Description page for more detailed information and Sites and Facilities Descriptions page for detailed information on the Camp Sites and the Cabin. Lots of forested area for games, recommend Zone D.
From Aylmer take Hwy. #148 to Shawville (approximately 74 km). Turn north on Hwy. #303 to Otter Lake (37 km). In the village of Otter Lake, make a sharp right turn at the first stop sign (post office on left and corner store on the right). Proceed to the small cement block Baptist church on right (3/4 km). Take the left fork onto Picanoc Rd. until your reach Scout Rd. on the left side and turn here (less than 1 km). The camp entrance is at the first wooden gate on the left at the scout sign. Please note that there is also an alternate route to Otter Lake from the northeast via Kazabazua (north on Hwy. #105 from Hull to Kazabazua and then turn left on Hwy. #301). There is just something about a camp fire that brings a camp to the next level. The camp committee supports the need to teach youth how to build a fire, but we require all users to adhere to the provincial direction on when it is safe to have a camp fire. Please check the SOPFEU website for the Fire Hazard Level. Note you will need to enter "Otter Lake, QC" as the city. Camp Site Fire locations: Each camping site has a fire pit or ring. There is a mandatory fee for firewood of $5 per rental site per night. You are free to use any of the dead fall for your campfires or additional firewood for $5 per site per night you can use the pre-cut firewood in the Wood Shed or found stacked around the camp. Note the wood stacked around the camp is usually there to dry so please make sure the wood is dry prior to use. Also the wood stacked around the camp is NOT for use in the Cabin's wood stove! There is no potable water available on site at the camp, but 1.2 km away at the Otter Lake Municipal building there is a spigot/tap where users can get potable water year round. All garbage is to be taken with you. There is a garbage dump approx x km for the camp where you can drop the garbage off - Advise the attendant that you are with the Scout Camp in Otter Lake. The Camp is available for rent to members of Scouts Canada as well as Third Party Organizations. For direction on how to rent a Site, the Cabin, or the camp, please follow the direction provided on the Camp Otter Lake QC Rentals web page. For Rental Rates please refer to the Camp Sites Descriptions and Rates webpage. To verify if a desired date is available please consult the Camp Rental Schedule. Be sure to check specifically for the site(s) you wish to rent. Note: you can also check the Camp Otter Lake QC Calendar. Scout Camp Otter Lake QC is managed by the Camp's Management Committee. Please check out the committee and what it is up to. The Camp Otter Lake QC Crest is available either by ordering the quantity desired when placing your Camp Reservation Request, or through one of the contact persons listed above. The crests cost $3 each. When it comes to using cellular phones with (613) area code it will automatically be transfer to the 911 services in Ontario, if you are reporting an emergency in the province of Quebec with you cellular phone, please call 819-310 4141 or * 4141.